I used to think of Diane's knowledge of her own adoption being just something she'd have always known because it was obvious, but it occurred to me that I was looking at the situation from an informed adult perspective. 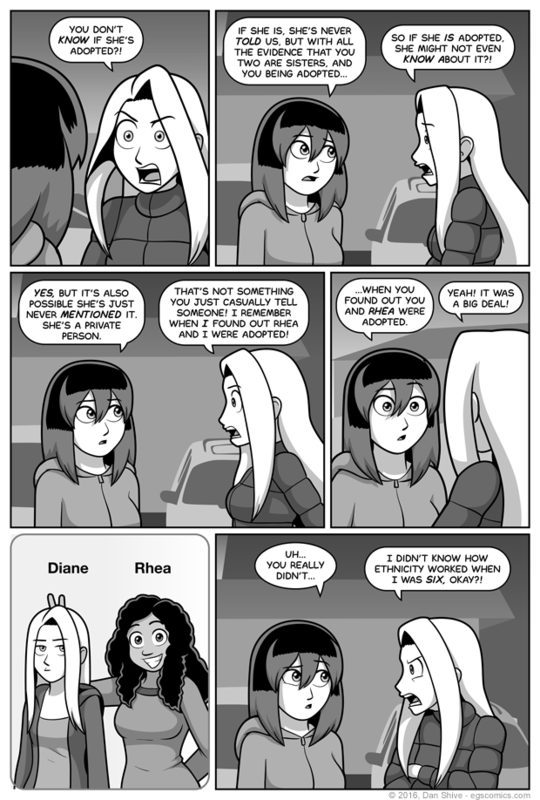 Diane's perspective during the first few years of her life would be significantly different, and I find it interesting to consider that perspective. There are people who will tell you children are "colorblind" to race, the truthiness of which being somewhat dependant on what's actually meant by that. If one means people aren't born with existing societal prejudices programmed into their brains, then yes. If one means children just don't notice that different ethnicities exist, then no. Children do notice these things. Just as they're not born with learned prejudices, however, they're also not born with all the facts of where ethnic diversity comes from. On top of that, if they ask about it, a lot of adults will respond by telling them they shouldn't talk about such things, leaving the kids to figure things out for themselves. EDIT: I've decided to make the next story comic Friday. I've mostly been dealing with sleep deprivation this week, but I was also dealing with script indecision. I'm over the latter now, and need to get over the former by sticking to a strict sleeping schedule (something I've never said I needed to do before and I'm sure will never need to say I need to do again because I LEARN from my past mistakes). Next week will be back to Mon-Weds-Friday come hell or high water, which I hope is not a literal expression. I've gotta admit, if Satan shows up or flooding happens, there could be delays.